Peel and finely chop the onion. Chop the rhubarb. Heat one third of the olive oil in a pot and sauté the onion over medium heat for approx. 5 min. Add cane sugar and red wine vinegar and bring to a boil. Cut the chili peppers lengthwise. Lightly crush the coriander seeds with the side of a knife. Add the chilis, coriander seeds, star anise, and mustard seeds to the pot and simmer for approx. 10 min. Peel the orange with a vegetable peeler and cut into thin strips. Squeeze out the juice of half the zested orange and add to the pot with the orange peel and the chopped rhubarb. Simmer the chutney, uncovered, for approx. 15 min. until thickened and the rhubarb is tender but not mushy. 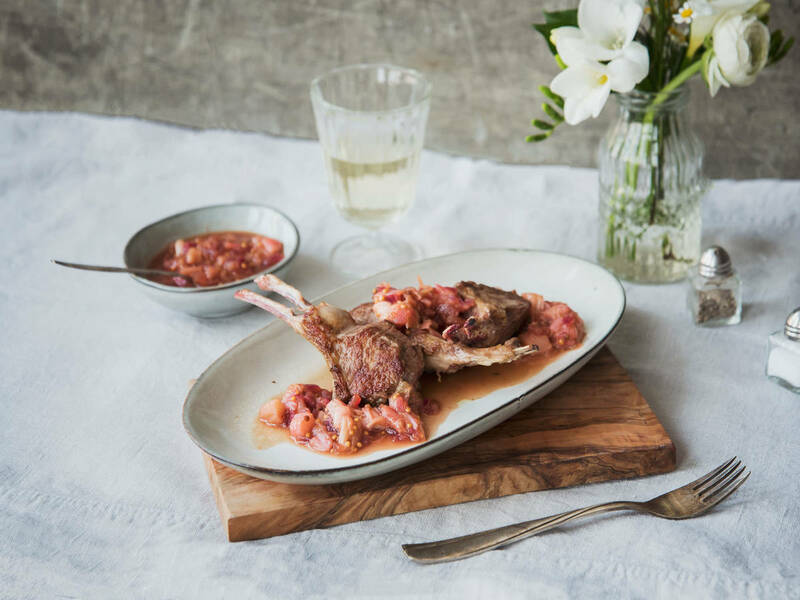 Heat the remaining olive oil in a pan and sear the lamb chops in it on both sides until they reach the desired degree, for medium approx. 1 - 2 min. per side. Remove the chops from the pan, season with salt and pepper and serve with the rhubarb chutney. Enjoy!